The Occupational Safety and Health Administration (OSHA) has updated their recordkeeping requirements for the first time since 1971. This results in a significant number of changes for every employer with ten or more employees, which can often cause confusion and failure to comply. OSHA 2002 Recordkeeping Simplified goes beyond the explanation that OSHA supplies to provide an easy understanding of these new requirements. 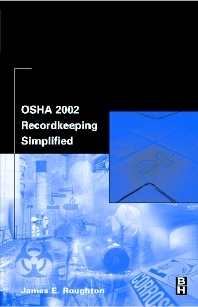 OSHA 2002 Recordkeeping Simplified provides an easy to follow format that allows all those in charge of recordkeeping to comply with the updated standards. The book follows the standards as OSHA provides them and adds commentary in order to explain and simplify. Jim Roughton provides a comparison of the old standards to the new to allow for an easier transition. The text is divided into several major subject sections. First the requirements are addressed to outline new elements compared to the current requirements. Next the supplement information for each subject area is divided into several parts: The first part reviews the relevant sections of the requirement and provides the basic concepts of how recordkeeping works; the second part provides answers to most frequently asked questions about recording and reporting of occupational injuries and illnesses. These questions and answers elaborate on the basic recordkeeping concepts and are further defined in each section. In addition, a series of flow diagrams are used to track the flow of the standard and examples of citations are offered through case histories.